Joseph Hinson is the second man of the two man team and front-end developer for Out:think Group. He lives in Virginia with his wife and daughter. When he's not working or hanging out with his family, he geeks out at his personal blog and plays xbox. This is a guest post from the talented Joseph Hinson. Interested in seeing your name up here too? Get in touch! In this post I’m going to talk about how to use WordPress’ attachment functionality to automatically detect and wrap mp3s in a player. If you want to your mp3s to automatically be wrapped in a player, you can incorporate that functionality into your theme by using the JW Player (or any other embeddable player) and WordPress’ get_children() function. All you have to do is upload the mp3(s) and the theme takes care of the rest. You get to learn more about get_children(), which you can do a lot with. The JW Player can handle video and audio, so with a slight code modification, you’re in business for playing movies as well as music. You don’t have to install a plugin that might break in a future version of WordPress. There are several embeddable mp3 players that you can use. I was using google reader’s player for awhile until I realized it doesn’t work well in IE, so I decided to go a different route here and use the jw-player. Longtail Video’s JW Player is free for non-commercial use and works in seemingly every browser. It’s even got an easy setup wizard if you need help getting your embed code worked out. And though I use the term mp3 throughout this tutorial, the JW Player supports m4a as well. I’m going to download the player and store all the files in a subdirectory of my theme called “jw”, so I’ll use the WordPress function template_url /jw/ to point to that directory. In reality, it’s http://my-site.com/wp-content/themes/my-theme/jw/. Loop through the mp3s attached, showing each mp3 in the embedded player. I’m passing a parameter to get_children of post_parent = $post-&gt;ID. This passes the ID of the page/post you’re on to the function. As long as you’re inside the loop, this will work, otherwise, you have to somehow get the ID then pass it in a different way. The parameter numberposts is set to -1, which means it will show every uploaded attachment that matches the mime type of audio. You can change this to a number if you would like to limit the amount of songs that show. I’m using $mp3-&gt;ID (the ID of the mp3 attachment itself) to make sure that each instance of the player has a unique ID, otherwise the players will break each other. Once more, this time with Gusto! This works well for showing the players, but what about the title and description? You can also pull that info from the attachment. In the next example we’re going to wrap each mp3 that’s attached in an li with the attachment title and description also being shown. I’ve wrapped the p and h4 tags in if statements that check to see if the values of the title and description actually have content before the elements are created. If nothing is filled in for a description, the paragraph tag doesn’t get created. Helpful Tip: You can find out what is stored in any array by using the PHP function print_r(the_array_name). It will print out a list of values stored in the array. It gets a little jumbled in the content, so view source for best results if you use this. Done and Done. But don’t screw up now. Once you’ve inserted the code in your theme, all you have to do to to take advantage of your new found functionality, is upload an mp3 using the “Add Media” button through the WordPress Add Post page. 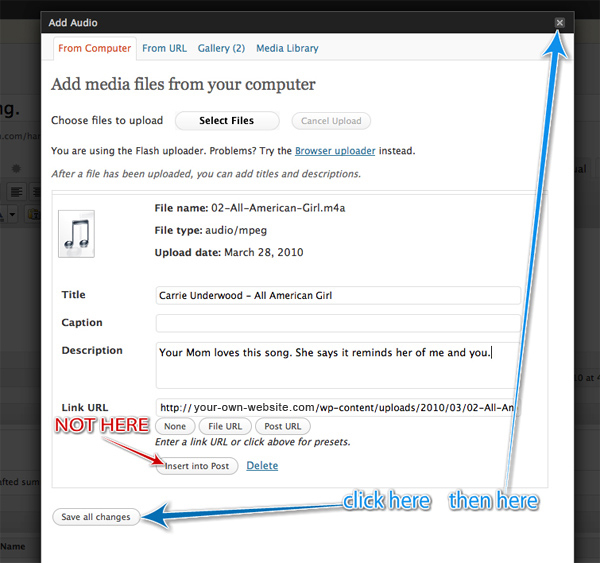 Once you’ve uploaded your mp3, just click “Save All Changes” and close. Don’t click “Insert into post”. For some reason, the mp3 doesn’t get registered as an attachment if you insert it into a post. Before you guys give me crap about liking Carrie Underwood, let me just disclaim that this is for my daughter’s blog. I’ve tested this with mp3s and m4as. For some reason, my WordPress install gave me a bit of a fit when I tried m4ps, but I’m pretty sure the JW Player supports them. Even if this functionality isn’t something you specifically need, it is still a good exercise to try this if you’ve never learned about get_children(). You can do a lot to enhance your theme with it. What about you? Do you currently use get_children() or something similar to beef up your theme? If so, tell me about it. Interesting stuff. I’d like this to work on an the iPhone OS. Do you know of any solutions like this that do not use Flash as the engine? Cool. Thanks for the response. Much appreciated. Your site consistently gives me great articles to read. This is the perfect addition to my latest article at http://www.tgrayimages.com/automate-file-attachments-on-your-wordpress-posts. I updated my article according to your sample and linked back to the page for reference. Thanks! Great idea! I’m making a electronic music blog right now and this will sure come in handy. Nice post. The idea of getting all attached mp3 files via get_children is cool. Anyway, I think creating players for each mp3 file is not good. Instead of that, we should create a playlist. If you wrap your print_r function in html pre tags, it will display in a nice, neat, orderly list. This is SUPER helpful for seeing details more clearly. ha — after the echos it is supposed to have pre tags in that last comment — looks like they were stripped out! sorry guys. I have used that method before as well and it is very helpful. Thanks for contributing! Awesome info, bookmarking for future reference! ah, excellent! i’m working on a punk record label site and may very well be able to use this with it! i’ll be glad to learn a little about get_children() too and see how else that can be used in wordpress. really helping and this is an future enhancement. hello. I think its just me, but i just cant get this thing to work on WP. Im sorry but i just dont understand where im supposed to put all (one of the three provided, right?) this code. I tried this on single.php (pasted the code somewhere) but im not sure..
And if i upload the *.mp3 file via “add media” and close the window. I have to use the “File URL” and add it to the code but there is where it gets kind a complicated to me.. I think im missing something here, but i just cant figure that out. Please help me out. Quite interesting tutorial for those sites which provides some kind of online help. do i need to change anything else then the mime-type to get it work with video? you should only have to specify the mime type and change the height to accommodate the video. Its really helpful n nice post. yes ! 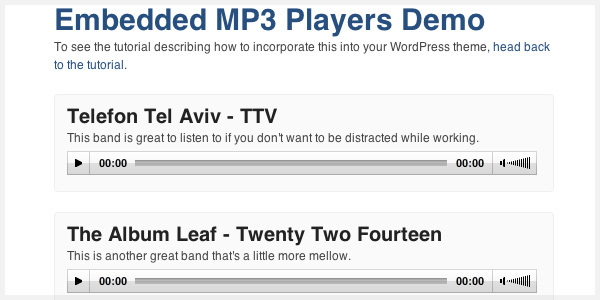 now i can i add my fav MP3’s to wordpress and play it from anywhere. Thanks for such wonderful post. Cool! I think I have just found my new favourite wordpress plugin.. JW player all the way – going to try it out now, thanks for sharing! This is just what I needed and it works great! Thanks for sharing. Joseph, thank you for the excellent article. I’ve been trying to tweak the code to get the song to automatically play. I know it’s autostart=’true’, but haven’t been able to get it to work. Any thoughts would be appreciated. Thanks again! Want it autostart. How to do? Waw, very excellent, I like it n I want to try it. Tanks alot. simply great, Earlier I was facing some issue, but after reading this great post, issued resolved. This will be very useful for my dj course blog – never been able to post mp3s, I put it in the too hard basket and finally the solution has landed on my lap! BANG!!! This site gives me great content to ready everyday. Thank you for sharing. They are useful. Thank you for your introduction, now i know how to do it. I like this blog very much, Its a real nice billet to read and receive info . “Do pleasant things yourself, but unpleasant things through others.” by Baltasar Gracian. great tutorial. will add this tutorial in my website. There are certainly plenty of particulars like that to take into consideration. That could be a nice level to bring up. I offer the ideas above as basic inspiration but clearly there are questions like the one you bring up where the most important factor might be working in sincere good faith. I don?t know if best practices have emerged around things like that, but I’m certain that your job is clearly recognized as a fair game. Both girls and boys really feel the influence of only a second’s pleasure, for the remainder of their lives.